A number of signs suggest Buddhism is at a crossroads in the kingdom of Thailand. If a video that recently made the rounds on YouTube is to be believed, Thai monks are living it up. The video shows two monastics aboard a private jet decked out in saffron robes and trendy aviator shades, with one listening to headphones and the other toting a luxury brand (Louis Vuitton?) travel bag. While the video doesn’t show much else, it revealed enough to send Thai Buddhists into an uproar over what the public perceives as the tightening grip that materialism has on the nation’s youth. According to a report in the Bangkok Post, the footage prompted Thailand’s Office of National Buddhism to rebuke the young monks, who are traditionally expected to lead ascetic lives of contemplation. For better or worse, Nopparat has a point. In our technology-infused world, it’s nearly impossible to avoid creature comforts. For monks, discernment is the key. But these young monks do not seem keen to be cooped up in Khantitham Temple in Thailand's northeastern Sisaket province, where they have been confirmed to reside. Ironically, the temple’s home page suggests: “The true core of those who preach Buddha's teachings is to not own any objects at all.” As seen in the video, however, Thailand’s growing affluence makes this ideal a hard one to live up to. The monastic jet set has largely evolved alongside society at large. Nopparat pointed out that many worldly possessions are donated to the monks by followers. “Some bought them sports cars,” he said. “This is by no means necessary.” One such monk, an abbot named Luang Phi Namfon of Wat Pailom in Nakhon Pathom, even received an old Jaguar from the owner of a Thai restaurant in the United States, according to the Bangkok Post. But it doesn’t end with cars. 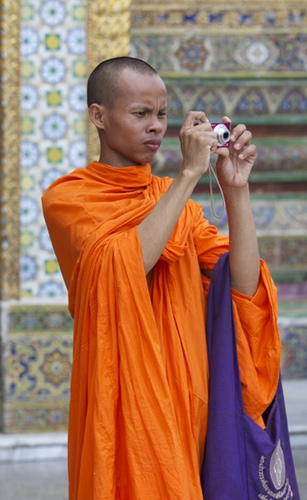 In 2012, around 300 of Thailand’s 61,416 Buddhist monks and novices were reprimanded. Many were removed from the monkhood altogether. Their list of sins includes breaking their vows of celibacy, drinking alcohol – even extortion. It bears noting that this is not the first time monks have come under fire for their worldly ways in Thailand, home to the world’s largest Buddhist population. A similar YouTube incident occurred in 2011 when a temple felt its image had been tainted by a video of dancing monks that went viral. This ongoing series of incidents begs a question. As much as Buddhist traditionalists may try to reign in the cultural tides, is it possible to stem the onslaught of materialism? According to a Citigroup report on Asia’s retail environment, around 19 percent of households in Thailand will have incomes above $20,000 by 2017. For perspective, that number was 2.2 percent in 2002. Further boosting consumption is the nation’s surging loan growth. This fiscal growth has trickled down to monks, who are increasingly lured away from temples and into the cities to pursue more worldly aims. This reality was driven home by an article in The New York Times last December. As the report notes, monks in the northern Thai village of Baan Pa Chi no longer do their morning walkabout to collect alms – one of the defining rituals of Buddhism. Now, temple abbot Phra Nipan Marawichayo calls a local restaurant to have takeout delivered. Monks numbers have also dropped. Estimates for the number of monks in Thailand today range from around 200,000 to as low as 70,000, having fallen by a dizzying 50 percent in the past three decades. In other words, there hasn’t been any time to acclimate – the shift was abrupt. But can a spiritual philosophy like Buddhism – steeped in the tradition of sitting, doing nothing and observing the self – be packaged like “instant noodles” without losing its essential flavor? While spiritual innovators work on the trappings of Buddhism 2.0 – a work in progress – Thailand’s cities continue to swell while its temples become empty. Celebrating Loi Krathong in Sukhothai in northern Thailand.